At the start of the year, I embarked on an ambitious mission to post on my blog for the entire 366 days of the year. It all started well and I was quite happy to cover a variety of topics. With each passing day, my drive to achieve the goal increased. Completing 30 days, I was jubilant. At the end of 60 days, I was over the moon as well as amazed. I was looking forward to complete the third month when at the start of March, I was overcome with a big wave of dejection. Suddenly, I was a feeling a big block and could not write anything. After 61 days, I had to abandon my mission with an immensely heavy heart. I have since reflected and have been back to my good old self. A couple of weeks back, a good friend, fellow Red Devil and book club member suggested I sign for up for something innovative. 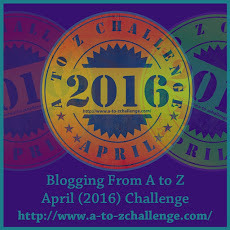 It was the ‘Blogging from A to Z Challenge’. The challenge is to write on all days of April except the four Sundays thereby covering each letter of the alphabet once and all 26 letters over the course of the month. On the threshold of the start of the challenge, I am contented that I signed up for this. I have a few thoughts and plan to write randomly covering the letters of the alphabet. I can’t wait to start writing again. It’s something I have loved since I was 10 years old and has given me some awesome moments of happiness. I’m sure this challenge will also give me a fair share of happiness. April 1, come soon! #366days366posts – Day 61 – Anagrammatically yours! pale mare; can hen deem snag? deep angle he cares, man; man! seem need anagram – can help!